Srinivasa Sastri was an Indian politician, administrator, educator, orator and Indian independence activist. He was acclaimed for his oratory and command over the English language. 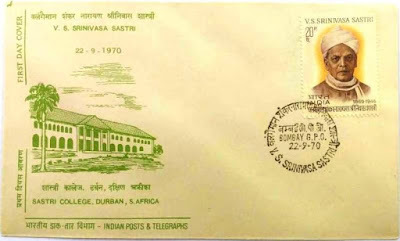 Srinivasa Sastri was born to a poor temple priest in the village of Valangaiman near Kumbakonam, India. He completed his education at Kumbakonam and worked as a school teacher and later, headmaster in Triplicane, Madras. He entered politics in 1905 when he joined the Servants of India Society. Sastri served as a member of the Indian National Congress from 1908 to 1922, but later resigned in protest against the Non-Cooperation movement. Sastri was one of the founding members of the Indian Liberal Party. In his later days, he was strongly opposed to the partition of India.